I was at the MNGOP State Central Meeting last weekend, which also served as the unfortunate unveiling of the Draft Senator David Hann for Governor movement. Hann, if you recall (and you should, considering it was very recent), was just elected to be the minority leader of the MN State Senate. Flash forward a few weeks and he’s at SCC being tailed by a video camera while we’re all greeted at the door by a guy in a “Draft Hann” T-Shirt. Hann’s team will have you believe that the Senator had no idea this was coming, despite his son being one of the organizers of the movement. While I have my doubts about his claim, the reality is irrelevant. Perception, as they say, is reality, and there wasn’t anyone in that meeting hall who thought Hann was an innocent bystander in this “draft” nonsense. But the problem here goes beyond a simple amateurish and tin-eared political maneuver. Hann was just elected by his peers to be the face of the Senate for the next two years. With this position comes guaranteed media attention. That attention should be focused on the message of the Republican Party and countering the DFL narrative, not on promoting David Hann’s personal ambitions. While Hann allows this “draft” to continue, the media, who revel in speculation and horse races, will continue to make Hann’s ambitions the story. Every move Hann makes will be seen through that lens. Every press mention will include the phrase “potential candidate for governor” serving as a subtle little reminder that his motives are tainted with the prospect of personal gain. And every word written about Hann the potential governor is a distraction from the type of disciplined messaging we desperately need. If David Hann wants to run for Governor, he should declare now and step down as Minority Leader. If he wants to be the Minority Leader, then he needs to quash this draft movement and get to the work of being a Minority Leader. I don’t much care what he chooses, but he can’t do both. I never bought the line that the 2012 elections signaled the death of the center-right nation or any of the other apocalyptic interpretations of the results. Republicans got outworked, outspent, and our messaging and candidates didn’t resonate. Sometimes you lose elections. It happens. Jim Geraghty of National Review wrote a few weeks back that Mitt Romney really lost the presidency by about 407,000 votes, or roughly three-tenths of one percent of the total votes cast. Here in MN Republicans lost the State House by a similar margin: 3,811 votes. Or, 0.1%, if you prefer. Going into the election the GOP had a 72-62 majority in the House. After the election, the numbers basically flipped: 73-61 DFL. We needed to keep 8 additional seats to retain control. There were 8 seats that were decided by fewer than 1,000 votes each in favor of the DFL. Note also, that in three of these races the winner obtained less than 50% of the vote. In each of those instances there was an Independence Party candidate on the ballot. The IP candidate got more votes than the margin in all three. So it’s good to see that third-party spoiler effect is still in action. Yes, we lost in November, and we do need to perform the requisite soul searching that comes after a major defeat. But we also need to make sure that we keep some perspective, and that we’re learning the right lessons. "What am I to think about a Senate District 45 Republican Party officer calling me “nasty and vile” in his blog and the reality is that he has never met me nor talked to me? I believe this is an indicator this person has very little in the way of personal integrity and absolutely no regard for truth or reality." That Senate District 45 Republican Party officer is me. The blog in question is this one. I believe that the particular post Bowman is referring to is this one, where I lay out my ballot choices for tomorrow. In case it’s not obvious from the context, I’m not backing Bowman. I have watched several videos of Mayor Bowman on Channel 12, our local Cable Access station, and I have been to two debates where she was a participant. A few days ago I sat just a few seats away from her in the audience during the city council debate. I find it rich that the Mayor feels that it’s improper for me to make a judgment about her because we’ve never met, but it’s totally proper for her to judge my integrity and regard for the truth, even though, according to her, we’ve, you know, never met. But this isn’t entirely surprising, since self-awareness and an understanding of irony are not the Mayor’s strong suit. This is, after all, the same woman who in one online tirade says she “hates” her opponent, and then also claims that she is the “positive” one in the race. I called Mayor Bowman nasty, spiteful, and classless. I stand by that statement. In Bowman’s first debate this election cycle she said her opponents were going to claim “evil lurks around every corner”. (They didn’t.) She admitted in the second debate that many find her “abrasive” but she considers that “leadership”. She’s called her opponent a “liar” on many occasions, and as I covered above, she also said she “hates” him. I think that covers nasty and spiteful. As for classless, that impression was gained primarily by observing the Mayor’s body language during the debates. When she was on stage she gave Al Gore a run for the money with her head shakes and eye rolls every time her opponents spoke. During the City Council portion of the debate, when Bowman was in the audience, she added arm-folding and nasty comments under her breath to the head shaking. To me, this type of open contempt for people you disagree with shows you lack class. Now, about “regard for the truth,” this post from Community Solutions lays out the case that Bowman has very little, at least when it comes to the Crystal Airport. I hope that the Citizens of Crystal elect a new Mayor when they go to the polls tomorrow. Jim Adams is a great guy, and a class act. If they choose to retain Bowman, I hope that we can get a mirror installed in City Hall, because I think she needs a little time for self-reflection. P.S. For even more classy fun, check out Bowman’s response to her critics on Facebook. Issue: some Election Judges are being told they cannot explain that a blank vote on the amendments is an automatic “NO” vote. Other counties are requiring EJs to read the amendment instructions. Yep, you read that right. In some areas, Election Judges are being told that they are not allowed to explain to voters how the voting process works. I have confirmed that Election Judges in the City of Crystal were given this instruction at their training. What is not clear is where this direction ultimately came from. Who believes that it is improper for an Election Judge to honestly and accurately inform a voter about how the process works? Recommendation: Read the directions to the voters. If stopped, reference Minnesota Statute 201.27, Subd. 1 which says, “No officer, deputy, clerk or other employee shall intentionally…fail to perform or enforce any of the provisions of this chapter (to enforce election laws)… An individual who violates this subdivision is guilty of a felony. From the Secretary of State website: Q: Is it true that if I don’t vote on a constitutional amendment, it is the same as a “no” vote? A: Yes, that is true. Constitutional amendments by law must be passed by a majority of all of the voters who vote on Election Day. Therefore, if you don’t vote on this question, the effect is the same as a “no” vote. The Demonstration Judge (pp. 30, 21 of the 2012 Election Judge Guide) must remain impartial but is expected to explain how votes are counted. The 2012 Guide does not say anything about the specific constitutional amendments, it would be good practice to inform the voters of the guidance provided by the Secretary of State. Thus, when you point to the area of the ballot containing the two constitutional amendments, the Demonstration Judge should either read the instructions and the amendments OR say the underlined phrase above. What To Do About the League of Women Voters? The League of Women Voters, if it ever was a “non-partisan” organization, has made it abundantly clear that those days are over. Their over-the-top advocacy against the Voter ID amendment this year has shredded any claim they may have had to being impartial. At the same time, the League is deeply entrenched in our political process. I happened to catch a bit of one of the 1980 presidential debates the other day, which was, incidentally, sponsored by the League of Women Voters. While the League is now out of the Presidential debate business, in most parts of Minnesota, the League is the only organization that sponsors debates for state or local races. I’ll be attending two LWV debates this week. Several Republican candidates have refused to participate in LWV debates this year, as a protest of sorts against the League’s over-the-top behavior. While I do understand where those candidates are coming from, one-off boycotts of LWV debates is a losing strategy. Do nothing, continue to complain. This is a stupid approach, but it’s the default and what we’ll end up doing if we don’t make a plan, so I thought I’d include it. Marginalize the LWV – Expose the League for who they really are. Mock the League and call them the League of Liberal Women Voters. Get all GOP candidates to boycott the debates and try to destroy the League’s influence in politics. While this strategy may feel good, it would also take a ton of effort and organization and will ultimately fail. Please name one example where the Right has been able to tear down an established institution on the Left and keep it down. While you’re thinking about it, I’ll move on to #3. Build an alternative organization. Fill it with Conservatives and get them to sponsor debates and put out a voter’s guide to combat the liberal bias. Not a terrible idea, but again, it requires a ton of effort, organization, and fundraising. It will also require time. Remember, the League has been around since 1920. They didn’t get where they are overnight. Infiltrate. Get conservative women to join the League, and change the organization from the inside. And now we’re talking. This, if it isn’t clear, is my humble proposal. The League already has the partnerships and infrastructure in place to execute debates all across the state. They have agreements with cable access channels to broadcast the debates. They have a longstanding partnership with Target to print and distribute a voter’s guide. And most importantly, they are going to do what they are going to do regardless of what we do. I guess what I’m saying, in the simplest form, is- “If you can’t beat ‘em, join ‘em.” And I don’t think we can beat ‘em. So what do you say, conservative women? Will you join ‘em? The city of Crystal, MN has been helmed by Mayor ReNae Bowman for the past 8 years. In that time, property taxes have gone up and the city government has grown. That should be no surprise, because Bowman is, after all, a member of the DFL. It’s also no surprise that Bowman, faced with the very real prospect of losing her seat this year, will fall back on the tired DFL tactic of name-calling, flailing, and calling her opponent a liar. But Bowman finds a way to up the ante a bit more. My challenger laments on the issue of taxes in our city, my challenger lies when he talks about the tax rate. I hate a liar, I have never lied to get elected. My belief is that if a candidate is willing to lie to get elected, what will they be willing to lie about after they are elected. I have proof to back up my statements, can my challenger prove his statements? We’re used to DFLers lashing out and making bizarre statements when they are challenged (see Ellison, Keith) but I think this is the first time I’ve actually seen a political candidate say they “hate” their opponent. Even Ellison stopped short of that during his latest meltdown. And yes, she said she hates her opponent. If you’re unclear on that, try recalling your Junior High Algebra: If A=B and B=C then A=C. My opponent is a liar, I hate liars, and therefore, I hate my opponent. QED. You’ll note that nowhere on her website can Bowman point out where or how her opponent is wrong or lying. Facts are inconsequential when your political mentors teach you that you can just reflexively yell “liar” when challenged. This isn’t the first time that Bowman has lashed out at her opponents. I covered her bizarre behavior at the LWV debate during the primary. Vote for ReNae Bowman on November 6th, a candidate with a positive, proven track record of citizen service and respect. I hate my opponent, but vote for me because I’m the one with the track record of respect. Got it. To vote for a candidate that will respect all of the citizens of Crystal, even the ones who dare to disagree with him, vote for Jim Adams. Let’s retire the Mayor from her style of “service” for good. Brett Stevens wrote a fascinating post earlier today, speculating that part of the reason we’ve seen Keith Ellison in full meltdown mode lately is that he knows that challenger Chris Fields is drawing blood, and that the DFL sharks in Minneapolis have begun circling. It’s worth remembering that Keith was not the first choice of many Democrats when he won the primary in 2006. He only took 40% in a 7-way race. Since then, he’s held on to a seat that’s D+23 against severely underfunded challengers. Not exactly a difficult task. I also know from my time with the Fields campaign that more than a few prominent Democrats in Minneapolis have privately confessed their frustration with Ellison. One even mentioned that Keith likes to pretend he’s Mr. North Side, but they’d be surprised if Keith could even find the North Side without his driver these days. Democrats in Minneapolis are used to effective representation in Washington- having been represented by Martin Sabo for almost three decades. Sabo was a guy who brought home the proverbial bacon, and was known for knocking doors in his district, despite his huge electoral advantage. Not the type of guy you’d accuse of not being able to find the city without a driver. There’s no question Fields has been getting under Ellison’s skin. After all, confident incumbents don’t tend to scream “That is a lie. You are a liar, sir. That is not true,” at their opponents in debates. If Ellison makes it through this election without suffering a major breakdown and manages to get re-elected, it will be interesting to see if he gets a primary challenge in 2014. I hope so, because if it has to be a Democrat that represents the fifth, I’d at least prefer a competent one. If you’ve been following along with the saga of CD5, you know what a sorry state we’re in over here, thanks to the “leadership” of the Destroyers, who have taken over our district and run it into the ground through a combination of negligence, incompetence, and deliberate behavior. If you haven’t been following along, get caught up here, here, here, here., and here. You should also take a look at the drama over in CD4 (here, here and here), so you can see that Destroyer takeovers are not a uniquely CD5 thing. It’s pretty well known that the Destroyers will be making a play for control of the State Party next year. I thought I’d offer a preview of what we’re in for if we allow that to happen. On September 20, 2012, the CD5 executive committee held its second meeting of this election year. Rumors had been swirling that CD5’s Destroyer-in-chief, Chair Adam Weigold, and even possibly his Deputy Destroyer, Mark Johnson would be resigning at this meeting. That didn’t happen. Instead, the first order of business at the September 20 meeting was to appoint 4 new Vice Chairs to the do-nothing organization. You can see them here, at the ridiculous new CD5 website, at the top of the 1700 word manifesto. If you’ve been around for a while, chances are you’ll recognize the names. If you don’t recognize the names, ask around. Going into this meeting, CD5 had a few thousand dollars in the bank. Because that cash is not in a Federal account, it can’t be spent to help CD5’s endorsed candidate, Chris Fields. Setting that piece of genius aside for now, as Builders know, you don’t leave money in the bank in an election year. It should be strategically deployed to help candidates who can win, especially in the last few weeks of the election. A proposal to make donations to winnable campaigns was brought up at the meeting. After a lengthy discussion, in which the proposal was modified to add the Honey Badger to the list, the entire plan was voted down. Several committee members felt that a few hundred bucks won’t make any difference to a campaign anyway, and one committee member felt the money would be better used for a party. OK then. So, we’re heading into the election with a few thousand dollars in the bank. Sorry, candidates, we tried. But maybe if you’re lucky you’ll get an invite to the party as a consolation prize. Advocate for BPOU autonomy, and resist all impositions on BPOUs from broader party entities. Coordination of congressional campaigns and assistance of other Republican candidates shall consist of directing volunteers to campaign committees, BPOUs, and political action committees. The plan of action herein shall endure indefinitely, until amended or repealed by the executive committee and/or the body. This is what CD5’s chair believes CD5 should do. You’ll note the lack of mention of fundraising, supporting and recruiting candidates, or coordinating BPOUs. You know, party building stuff. I have to give them credit for an interesting strategy. If people are harping on you for failing to do the job you’re supposed to do, just redefine the job. It’s brilliant, in a way. In an unexpected turn, the resolution failed to pass. Yes, the CD5 chair stacked the committee with friendlies, who less than an hour later voted against what was supposed to be his crowning achievement. Epic. It’s not clear whether his courageous battle for BPOU autonomy and fearless resistance against impositions will continue in spite of this embarassing defeat. Welcome to the circus, ladies and gentlemen. Consider it a preview of a State Party run by Destroyers. The Patch this week profiled HD61B GOP Endorsed Joke Candidate Nate “Honey Badger” Atkins. The profile contains some interesting insight into the Destroyers. But first a bit of background. District 61, the Honey Badger District, is in the heart of the Fifth Congressional District. The Chair of SD61, Mark Johnson, is also the CD5 Deputy Chair. He’s the guy who wrote the 1700 word post we covered here about “rebooting” the Fifth CD and “starting from scratch”. Which makes a bit more sense, when you read the wisdom of the Honey Badger. Atkins is part of a faction trying just that, by attempting to push social conservatives out of the state Republican Party in the name of Ron Paul and libertarianism. Campaigning on issues like legalizing marijuana, defeating the marriage amendment, ending wars, and tearing up the deal that gave the Minnesota Vikings money for a new stadium comes from a libertarian stance, Atkins argued that change was necessary to keep the party alive as its base ages and dies off. This is how Destroyers talk publicly. To the press even. Imagine the conversation behind closed doors. Destroyers are arrogant enough to think that the Republican Party should be remade in their image, and destructive enough to take things over just to run them into the ground. They try to push Builders out by creating drama and discord, and If they can’t push all the Builders out, they’ll just wait for them to die off. I want to thank Honey Badger for the moment of clarity. It will be helpful November 7. I want to open an invitation to all those who are upset at being labeled Destroyers. The SD45 Victory Office, located in Plymouth, is in need of volunteers to make phone calls. I just printed a few hundred pages of call lists. We have quite a few unidentified voters to identify. If you are in CD5 Leadership and want to prove that you’re not a Destroyer, I expect to see you there. Often. You keep telling others publicly how supportive you are of our efforts, but in reality I’ve never seen your bodies, in chairs, making phone calls. Actions speak louder than words. We have two very winnable house races in SD45- Jeff Pauley and Reid Johnson. Also- if you’re not a Destroyer, but you happen to live in a district run by one and want to make a real difference in a real election that can be won, we’d love to see you too. Call us at (612) 567-8501 or just stop by. We Waited 26 Days for This? If you’ve been following the farcical saga* that is the CD5 Republican Committee, you know that the CD5 “leaders” chose to allow their website to go dark a few months before the election. They did this by failing to pay the bill. The entire thing could have been resolved for around a hundred bucks, but it wasn’t. So what did we get after 26 days of darkness? A free google blog. And what’s posted on that google blog? A 1700+ word harangue that touches on Federalist #10, the difference between a Democracy and a Republic, and, of course, the RNC Rules change. In fairness, we also get a whopping 37 words encouraging people to support CD5’s endorsed Republican candidate, Chris Fields. CD5 is almost exclusively run by Destroyers. In fact, they added a few more to their Executive Committee last Thursday. Take a good look at CD5, because it is also the future of our State Party, if the Builders do nothing. Along with many others, I have been confused at the effort of the Destroyers to take leadership positions, and then do nothing with them. Why get elected to be in CD leadership if you don’t believe there is a role for the CD organization to play in the election? Serious questions need to be answered: Does the CD5 organization continue to host caucuses, conduct conventions, and elect delegates? Do we really spend all that time and effort just to send stooges bound to the results of a purely democratic popular vote? And there it is. It’s all about Tampa. Or more specifically, the National Delegate process. Builders naively think that a CD-level organization exists to support a Congressional Candidate, and to coordinate the BPOUs in an area, so that Republicans, all Republicans, can win more races. But for the Destroyers, it’s all about the national delegates. Because, Ron Paul. On another note, I have heard that some of the Destroyers are not too happy with the term “Destroyer” being used to describe them. I’ll concede it may not be the best term. But we have seen a group abdicate their duty to fundraise, organize, support candidates, and even hold meetings. They leave money in the bank for post-election parties, liberty festivals, or mythical FEC fines instead of investing in victory. So we’re left with two options. 1) They are incredibly incompetent, or 2) they are taking deliberate action to harm the Party. I suppose if they’d rather be called “The Incompetents” I’d oblige. We’re less than 1000 hours from Election Day. It’s past “all hands on deck” time. Action wins elections. Talk wins arguments. Work as hard as you can for your candidates, because you are also picking up the slack for AWOL leadership. No, it’s not fair, but it’s reality. While you’re working, take note of who is with you. Those are the Builders. Remember who they are, because we’ll need them starting November 7. *If you haven’t been following along, get your background here, here, and here. Being a resident of the Fifth District, I follow my Congressman, Keith Ellison, on Twitter. Or at least I did, until he blocked me today. Ellison has been a vocal critic of Minnesota’s proposed Voter ID amendment. He’s also been one of the leading disseminators of false information about the amendment. The latest lie Keith and his staff have been peddling is that Voter ID will mean that members of the military won’t be able to vote. The right to vote is essential. What about the right to not have my vote canceled out by fraud? Is that essential? RT @keithellison: The right to vote is essential. But was Keith saying it was a lie that he didn’t care about voter fraud? Or was he saying it was a lie that voter fraud cancels out legitimate votes? I asked him to clarify. Turns out the lie is that there is any voter fraud at all. @jpkolb, Sir you know the massive fraud claims are false. Photo Id advocates are lying about all this fraud stuff. So there you have it. Claims of vote fraud are false. Photo ID advocates are lying about “all this fraud stuff.” And I know it. @jpkolb, I know what you are all about sir. Hey, but at least he called me sir. Yesterday, I covered Keith Ellison’s bizarre claim that he “knows what I’m all about”. Today, I thought we could take a look at what Keith Ellison is all about. Although there is plenty of source material out there, I’m going to stick to the 4-Part Series that was published in the City Pages last week. I will note before we start that Keith’s words had to be paraphrased by City Pages reporter Aaron Rupar, in order to, you know, make his “logical flow” clearer to the readers. Now, back to the articles. Part one focuses on Keith’s thoughts about Chris Fields. And Cheerios. Keith starts by claiming that he doesn’t think his seat is safe. I believe it’s disrespectful to the electorate to act as though you’ve got it in the bag. That’s what Keith says to the media. However, when his staff is unaware they are being recorded, they tell a different story. Keith Ellison is all about telling people what they want to hear. Next we move on to North Minneapolis, where Keith claims to live. I started my political career representing north Minneapolis in the state Legislature. I’ve dedicated my life to north Minneapolis, but north Minneapolis had deep systemic problems in 1930. OK. North Minneapolis had deep systemic problems in 1930. It also has deep systemic problems now, like nation-leading gaps in education and unemployment. But Keith never mentions these issues. Instead he talks about maps from 1930. Keith Ellison is all about living in the past- not finding solutions for the future. Part 1 ends with the claim that “nothing Chris Fields says” bothers Keith, which is then contradicted in the next breath. I have to admit, nothing Chris Fields says bothers me, but it does get under my skin when he starts saying I haven’t done anything for the North Side. Keith then goes on to explain, for several paragraphs, how not bothered he is by Chris Fields. Keith Ellison is all about having thin skin. Part 2 starts off by asking Keith to respond to Chris Field’s criticism that he isn’t focused on the problems in North Minneapolis. In response, Keith talks about transit. One thing, we need to invest in transit, so we can help job seekers get to places where there are jobs. I’m a big-time supporter of Bottineau Commuter Rail, the Southwest Line, Northstar Commuter Rail — I’ve funded and worked hard to get Central Corridor, which should be up by 2014, and of course the Hiawatha Line happened while I was still in the legislature. Transit is big —[it] puts people to work, gives minority vendors jobs to work on, and after it’s built, helps people get jobs. Hear that North Side? That’s the sound of the train that will solve all of your problems. Choo-choo! On education- the solution is all day schooling. About the achievement gap — well, what if we had universal all-day pre-K and kindergarten and made sure every kid was reading by 3rd grade. Yes, our schools are failing. It’s probably because we don’t spend enough. Keith Ellison is all about tired old ideas and spending more money. Now, on to Part 3. This portion of the interview focuses on Keith’s role as an “Islam spokesman of sorts.” It’s also where Rupar’s efforts to channel Keith’s logical flow run off the rails, because the first few paragraphs are pure gibberish. The rest doesn’t get much better. The thing about it, freedom of speech, it’s a good and bad thing. It applies to everybody. Keith Ellison is all about… actually, I’m not really sure. Part 4 and we’re thankfully almost done. This one’s called “Keith Ellison on his vision for America”. I’d like to see progressive ideals have a more prominent role in our society, and what I mean by that is I’d like to see millionaires take the attitude that, ‘Hey, this is my country. I’m going to give back to my country through taxes and other ways, charitable giving.’ I’d like to see us invest in the public wealth of our nation. Anyone know what “investing in the public wealth of our nation” means? We have a governing philosophy — the politics of generosity and inclusion. Everybody counts, everybody matters. You won’t see ‘Vote for Ellison’ on any of my bumper stickers. Keith Ellison is all about embracing everyone! Unless you disagree with him. That gets you blocked on Twitter. I’ve really enjoyed the last two posts by David Faith here at True North. The first was exposing the voting record of Terri Bonoff, the incumbent DFL Senator in Faith’s district. The second was about Mark Stefan, a GOP candidate who is running for the MN House. In each, Faith, a SD44 Vice Chair, makes a thoughtful and reasoned case for his local candidates. I’d encourage you to read them both. But there was a part of the second post that really caught my eye. Emphasis mine. Many, indeed, most House races this year will not be close. Most districts are solidly in the bag for one party or another. That means that Republicans’ ability to maintain control in the legislature and provide a counter-balance to Mark Dayton will come down to an astonishingly small number of key races in swing districts. 44B is one of those districts. Depending on which index you look at, 44B is somewhere between DFL +3 and dead even, which means it is within the margin of error under even the most pessimistic assumptions. Republicans can win here, and they’ve won here before. Mark Stefan can win this race, but he needs support. If you’re in 44B, or if you’re in a district that will not be close, one of the best things you can do this election to advance economic liberty is to support Mark Stefan in any way you can. Faith is correct. Many house races will not be close. But many will. For instance, we have two very winnable races here in SD45- first time candidate Jeff Pauley vs. 40 year incumbent Lyndon Carlson in 45A, and Reid Johnson vs. Mike Freiberg for an open seat in 45B. The dynamics of redistricting in SD45 worked in our favor this year, and it’s conceivable we could win either seat, or, with some luck and hard work, both. Neither is a slam dunk, but neither is a lost cause. So here’s the pitch- if you live in a district that won’t be close (like say, if you live in Nate “Honey Badger” Atkins’ district) adopt a candidate from a few towns over and pitch in to help them out. It’s time to be strategic. If you’re an executive in a Senate District or Congressional District, and your committee is sitting on unspent funds, give some serious thought to where that money should go. Then spend it. Now. Money in the bank doesn’t win elections. Money spent on frivolous gatherings or next year’s Liberty Fest doesn’t win elections. If you hold any position within the GOP (from Delegate to Deputy Chair) you need to ask how much money your local committee has, and how it will be spent. If your committee isn’t planning a meeting, demand one. I’ve heard some really dumb plans for spending money lately. Is your district one of them? It’s imperative that we keep our legislative majorities. We have a governor who thinks resistance to tax increases is destroying our country. The only thing standing in his way is the GOP legislature. We only keep the legislature if we win elections. We only win elections if we think and act strategically. As the fight about the future of the Republican Party goes on, it’s important to clearly identify the sides. Some people, including myself at times, have been guilty of using “Ron Paul Supporter” (or derisive variants) as shorthand for the cancerous and destructive element within our party. That’s not entirely accurate. The battle, as Nancy LaRoche so eloquently put it the other day, is between the Builders and the Destroyers. The confusion comes in because there is significant overlap between Ron Paul supporters and Destroyers. But not all Ron Paul people are Destroyers. And not all Destroyers are Ron Paul people. A Builder is a Republican who believes in building and strengthening the party. We believe in a “big tent”, varied ideas, and a place at the table for anyone who wants to work. And mostly, we believe in winning elections, not arguments, because losing on principle is still losing. I work with Builders who happen to be Ron Paul supporters every day. A Destroyer is the type that allows a district’s website to go dark while they are off at Paul-Fest. A Destroyer repeatedly trashes their party’s presidential nominee on TV or through press releases. A Destroyer will say stupid things like “There’s no difference between Barack Obama and Mitt Romney, I’m voting for Gary Johnson”. When you’re 60 days out from an election, you’ll find Destroyers at bars droning on about Austrian Economics and RNC rule changes. That’s when they aren’t playing the part of the Media’s new favorite Republican. You’ll find Builders in offices making phone calls or on the streets doing lit drops and door knocking. Builders don’t care about titles. They understand that the same work needs to be done whether they have a title or not. Early next year we’ll gather to elect new Leadership for many levels of the Republican Party. Right now the Destroyers are working on the next phase of their destruction and getting organized. They are unencumbered by any sense of responsibility, and are taking advantage of the fact that the Builders are distracted by winning elections. If you are a Republican delegate you need to look around you right now and start identifying Builders and Destroyers. Come November 7, we have a lot more work to do. If you’re a MNGOP party official, at any level, and you’re openly supporting non GOP candidates, I have a suggestion for you: Resign. If you let your group’s website go dark 60 days before the election, Resign. If you are more concerned with an RNC rules change than getting Republicans elected in the next 60 days, Resign. If you honestly believe there is no difference between Mitt Romney and Barack Obama, Resign. We have work to do. If you’re not going to do the job you were elected to do, Resign. If you went to the website www.CityOfCrystal.us, where would you expect to go? The city’s official website? Me too. So would most reasonable people. 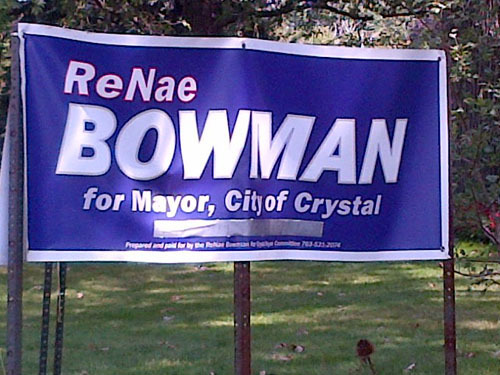 That website address gets you to the campaign site (such as it is) of incumbent DFL Crystal Mayor ReNae Bowman. I think that most people would agree that this is a dishonest and deceitful campaign practice- to tie your campaign to an official sounding website address. And we have some indication that Bowman herself, or at least some of her supporters, agree. Here is a photo, taken on September 3, of a Bowman for Mayor yard sign located at Hampshire Ave and around 40th Ave N. Note the website address, clearly visible. Here is another, also taken on September 3, at around 43rd Ave N and Douglas Drive. Note the duct tape covering up the deceptive website address. So what’s going on here? Why is the website address covered up on some signs and not on the others? Clearly, someone knows that the use of that address is wrong. The question is, who? Sadly, this type of deception is what we’ve come to expect from Bowman. Fortunately, Crystal residents have a viable alternative this year in Jim Adams. More to come. 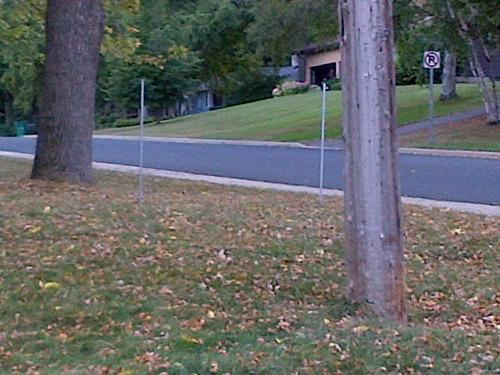 Update (9/5/12): Hmmm, and now the sign at Hampshire and 40th (the one with the visible address) is gone. Interesting. Two of Minneapolis’ most prominent “leaders,” Congressman Keith Ellison and Minneapolis Mayor RT Rybak, are out of town this week, hanging in Charlotte for the Democratic National Convention. Part of that engagement, according to Rybak, comes from a sense that mayors represent “the last functioning form of government in the country” — a world apart from Washington gridlock — where Democratic politicians can showcase their party’s values by protecting social welfare and economic growth programs even in a climate of austerity. What an interesting statement. You certainly have an achievement gap Mr. Mayor. In fact, it’s among the worst in the country. You also have an unemployment gap. On that measurement, you rank the worst. So while the citizens of Minneapolis are dealing with the reality of an undereducated and underemployed population, and living in the 10th most dangerous city in America, Rybak is the President of the National Conference of Democratic Mayors, and jetting off to enjoy the national spotlight. Keith Ellison is another Minneapolis “leader” who is addicted to the national spotlight. While some of his peers are skipping the DNC this year, Ellison went early. Just three of the six DFL members of Congress are expected to be in Charlotte this week. Rep. Keith Ellison is already in town hobnobbing with delegates and others. He has a full speaking schedule over the course of the week. Ellison’s excuse for being in Charlotte- going to the convention will help him with voter outreach, or something. Ellison added that his campaign has been working to identify DFL voters to turn out on Election Day. He said going to the convention will help with that grassroots work. The problems in Minneapolis, which is the heart of Ellison’s district, are huge. To actually begin to solve them would take hard work, dedication and focus. National speaking slots and fancy sounding titles won’t fix the unemployment gap in Minneapolis. Both Ellison and Rybak claim to care about Minneapolis, and both would tell you their number one focus is jobs. But if you judge them by their actions instead of their rhetoric, it’s clear that the only jobs that Keith Ellison and RT Rybak really care about are their own. Was MPR’s Tom Scheck’s Twitter Account Hacked? Unlikely. Following on the heels of Keith Ellison’s latest Twitter mishap, MPR’s political reporter Tom Scheck got in on the action with a Twitter controversy of his own. A few minutes later (by 7:50 PM) the tweet was deleted. At 7:56, Scheck himself jumps into the conversation, and starts with the “That wasn’t me” explanation. He was golfing, you see, and claimed ignorance of Eastwood’s performance. The back and forth went on for a while between Gilmore, Sheila Kihne, and Scheck. I’ve got the conversation archived here, at Storify. The bottom line is that Scheck claims that he was “hacked” and didn’t send the offending tweet. There’s been a lot of legitimate Twitter “hacking” going around lately. (Actually, most are the result of careless users putting their user name and password somewhere where it shouldn’t be, but the end result is the same- a compromised account.) Most “hacks” end up with the compromised account sending out spam messages like “Hey what are you doing in this picture” or “I saw you check out my profile”. Stuff like that. “Hackers” don’t typically tweet something controversial about topical news of the day, and then delete it a few minutes later. That’s usually a real person who has access to multiple Twitter accounts and hits the wrong button. Case in point - that’s the “official explanation” of the Keith Ellison incident from a few days ago. Or, it’s a real person who does something stupid and then hides behind a “hack” excuse. Let’s remember that Anthony Weiner went with the “hack” story until the alternative media, led by the late Andrew Breitbart, proved otherwise. MPR’s response to Sheila Kihne today seems to indicate that MPR has “social media editors” who “work with” Tom. @sheilakihne Scheck is on vacation and has been transparent about his account being hacked. @MPRNews social media editors work with him. My theory: one of these social media editors is the real culprit, and responsible for the tweet. Whether or not we’ll ever find out, I’m not sure. Rachel Stassen-Berger from the Star Tribune got to the bottom of the Ellison incident. However, it will be curious to see how the Legacy Media handles the Scheck affair, seeing as he is one of their own. Do I believe Tom Scheck that he didn’t send the tweet in question? He says he didn’t and I don’t have any real reason not to believe him. Do I believe that Scheck was “hacked”? Nope. That leaves an unnamed person with access to Tom’s account as the only viable option. I’m willing to take Tom’s word on this. But do I believe I’m giving Tom Scheck more leeway than he would give to me if the shoe were on the other foot? Today was the first debate between Congressman Keith Ellison and his challenger, retired Marine and first-time candidate Chris Fields. If I’m right, it will also be the last. After the trouncing Ellison received today, I would be surprised if Keith actually shows up for the planned KSTP TV debate in October. I’d imagine some type of “scheduling conflict” will be the excuse. Ellison has already been playing the “busy schedule” card as an excuse for ducking a debate with WCCO’s Chad Hartman- and that was before his embarrassing performance today. Now, let me be clear about something- if I were advising Keith, I’d encourage him to skip the debates too. Despite the fact that he is a career politician and a lawyer by trade, Ellison just isn’t good at debating. When you live your life in an echo chamber, like Keith Ellison does, you don’t have to be good at defending your positions. When everyone who you interact with agrees with you, it’s easy to start feeling really smart. And it was clear today that the effects of Keith’s time in the echo chamber have dulled whatever debate skills he may have once had. I live-tweeted the debate, which I then storified, because that’s a verb now. You can see that here, and it’s probably the best way to get the highlights of what was said on both sides. If you want to listen to the whole debate, you can find it here. For his part, Ellison alternated between babbling nonsensically, shouting at the audience, and talking over the moderator. He was on the defense, and clearly agitated. Sadly, the debate was on radio and not TV, because the eye-rolling, headshaking and general face-making on Ellison’s part reached truly Al-Gore-ian proportions. Fields was on offense, and went after Ellison for his addiction to big money. Fields also turned out a few memorable lines- including telling the audience that his wife owns a small business, and yes, she built that. The highlight of the debate (for me, anyway) was when the audience erupted into laughter when Ellison said he takes deficit reduction seriously. Another round of laughter ensued when Ellison named Paul Krugman as his favorite economist. I really didn’t know what to expect going into this debate. After all, Keith Ellison is a trained debater. But what I heard today was one candidate who was focused on the future, and another who is obsessed with the past. It’s time to move forward. It’s time to vote for Chris Fields. Richard Eggers doesn’t look like a mastermind of financial crime. The former farm boy speaks deliberately, can’t remember the last time he got a speeding ticket, and favors suspenders, horn-rimmed glasses and plaid shirts. But the 68-year-old Vietnam veteran is still too risky for Wells Fargo Home Mortgage, which fired him on July 12 from his $29,795-a-year job as a customer service representative. Egger’s crime? Putting a cardboard cutout of a dime in a washing machine in Carlisle on Feb. 2, 1963. Why would a big evil corporation behave this way? The government, naturally. Big banks have been firing low-level employees like Eggers since the issuance of new federal banking employment guidelines in May 2011 and new mortgage employment guidelines in February. I have a number of family members who work in banking, and I’ve learned from them more than I ever wanted to know about the crushing regulatory burden that banks are under. Congressman Keith Ellison, who is on the House Financial Services Committee, will tell you that all these regulations create jobs. But I’m guessing Richard Eggers and the “thousands of other workers” fired under these new regulations are going to disagree with that. When Dodd-Frank was passed in 2010, it was over 2,300 pages. Now, two years later, that’s ballooned to over 7,300. It will take banks over 25 million hours per year to comply with the first 224 Rules in Dodd-Frank, and they are still writing more rules. Every hour spent on a Keith-Ellison-approved compliance job translates into real dollars as a cost of doing business. And every dollar spent on compliance is one that is not invested in growing a business. Most of us (Ellison excepted) already knew that regulation is a drain on business. Now, through Richard Eggers, we’re finding out the human cost as well. Kurt Bills is going back to school. In what is a somewhat reassuring sign that he understands his chances of winning in the fall, Bills announced on WCCO radio yesterday that he would be returning to his job as a teacher at Rosemount High School this fall (via the Morning Take). I confirmed this with the Bills campaign (via Twitter), who clarifies that Bills will be teaching the first hour class that has been featured so prominently in his campaign. For me, this is the capstone of a poorly run campaign, which should now be left on its own to wither and die. Had I known that’s what I was doing, perhaps I would have changed my vote and instead joined the 49% who voted for somebody else. I was not even aware that “the establishment” preferred someone else. I guess I overlooked that in my pre-primary issues of The Daily Establishment. I, apparently ridiculously, thought “the establishment” was behind the endorsed Republican candidate. A few weeks ago, Michael Brodkorb wrote an open letter of sorts to Bills. I’ve never met Brodkorb (I was out of state during the Brodkorb era of the GOP) and I know that Brodkorb is a 4-letter word in many GOP circles, but that doesn’t mean the advice he gave Bills is off-base. In fact, it all made a lot of sense to me. Missing from Brodkorb’s advice list: “Campaign Part-Time during the last 60 days of the campaign”. That’s because you can’t effectively run a statewide campaign if you have to be in Rosemount for first hour every morning. It’s clear that Kurt Bills can read the writing on the wall and knows he has no shot of winning this race. So he’s doing the responsible thing and making sure he’ll be able to support his family after November. It’s time that the rest of the GOP understands this. It’s time to pull all resources from this race and re-deploy them to other races where we have a shot. Every dollar spent, every phone call made, and every yard sign placed for Kurt Bills between now and November will be wasted. Those dollars and hours would be better spent trying to defend our state legislative majorities, trying to pick up a Congressional seat, or electing good mayors, county commissioners and school board members. There will be plenty of time for finger pointing, blame, and figuring out how to avoid repeating this mess after November 6, and I think it’s important we have that discussion. But for now, the most important thing we can do is cut our losses, re-deploy our resources, and focus on what we can win. The Senate seat is lost. Kurt Bills knows it. It’s time to act accordingly. Many others had similar sentiments- now we can have an adult conversation, now we can focus on issues, the silly season is over, etc, etc, etc. With all due respect to Chris and the other optimists out there who are engaging in wishful thinking- you’re giving your opponents way too much credit. The last few days have seen an onslaught of what the Democrats think a “serious conversation” looks like. Joe Biden told an audience Romney/Ryan would put them back in chains. The President himself is talking about Romney’s old dog. It’s clear we won’t be having a serious, adult conversation. At least not if the Democrats can help it. We’ll be focused on tax returns, dogs, and pushing grandma’s wheelchair off a cliff. That’s when we’re not accusing Mitt Romney of giving people cancer of being a felon. People who say there’s no difference between political parties just aren’t paying attention. I agree with Mitt Romney- it’s time for Barack Obama to get his campaign out of the gutter so we can have a serious conversation. I just won’t be holding my breath waiting for it to happen. Disclaimer: I hold a volunteer staff position with Chris Fields for Congress. The opinions expressed here are my own. One of the biggest issues in the Crystal Mayor’s race, which has been championed by candidate Andrew Richter, is the lack of checks and balances among the Crystal City Council. There are many reasons this has come up as an issue this year, not the least of which is the fact that Mayor ReNae Bowman was dating, and is now married to (as of this weekend), one of the members of the City Council. Or it could be that Bowman, who has some bizarre vendetta against the West Metro Fire Department, had the council appoint her to the Fire Board as it’s “citizen representative”. Or maybe it’s because the council rarely ever has a split vote, especially on the budget. Or it could be because the council is known to cackle about the unlimited power they have over the city’s Economic Development Authority. The Mayor, for her part, had an interesting answer. She let us know that the City Council is it’s own Checks and Balances. Well, Madam Mayor, I don’t buy that. You won’t convince me that when 28% of the council is married, they are independent, and can act as a set of checks and balances on each other. And your other actions in office have shown that you, like most politicians, value power above everything else. It’s time for some real transparency in the Crystal City Government. 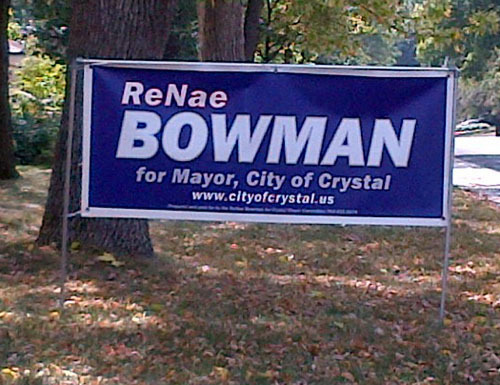 Let’s hope the voters of Crystal agree, and bounce Bowman out of contention on August 14. There are 3 candidates, incumbent Mayor ReNae Bowman, and challengers Jim Adams and Andrew Richter. I had not met Bowman before last night. I met Adams a few nights ago at the New Hope Lions Corn Feed and we had a short and pleasant conversation. I met Richter a few months ago, shortly after moving here, and have talked with him extensively about his vision for Crystal. Having not previously met the Mayor, I had the opportunity to form a first impression last night, and it was not a good one to say the least. The Mayor came off as incredibly unprofessional, rolling her eyes and making faces while her opponents were speaking. She was also on the attack. Bowman opened with a bizarre statement, claiming that her opponents were going to try to “make the case that the sky is falling and evil lurks behind each corner”. I think this speaks volumes about her perspective and her character. For the record, Richter and Adams stuck to making the case for why they were best suited to be the Mayor. Neither one made any “sky-is-falling” claims or implied anything evil was afoot. Both challengers offered substantive, thought out perspectives on how they would approach the job. The current Mayor chose to attack. It’s a common tactic, and one that she probably learned from watching her contemporaries in the Democrat party- If you can’t defend your record, just attack. Bowman also chose to close with an attack, equally as bizarre. This time she claimed that her opponents were not committed to the city because they didn’t show up at a recent budget meeting. I’m sure that attack line sounded good when she was rehearsing it in the mirror (Bowman read her opening/closing statements from note cards) but in the context of this debate the criticism fell flat. The sitting Mayor is expected to be at city budget meetings. That’s her job. There’s not an equal expectation on the part of a challenger. If the Mayor skipped the budget meeting, that’s news. If the guy running for Mayor did something else that night, it’s really not. Bottom line- Mayor Bowman failed at making the case for re-hiring her last night. Both challengers did well, though I think Richter showed a better grasp of the issues, and would be a stronger advocate for the taxpayer. More to come, including a look at Checks and Balances.